Last time we talked about the history and significance of Antique Silver Tea Sets. But surely no fine tea service is complete without a stunning silver serving tray. 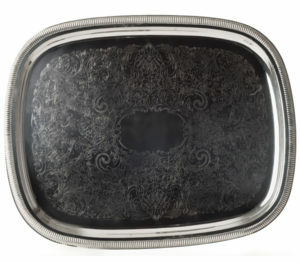 Antique and modern silver trays for sale can be found in a number of ways. For the modern shopper, online auction houses like ebay can be an excellent resource. However – call me old-fashioned – but I’ve always preferred visiting my local antique shop and digging for secret treasures! I’m often asked by friends, looking to add something new to their collection, about the bottom dollar. 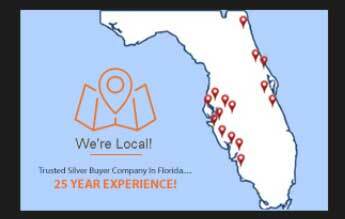 “What should I expect to pay for this or that?” or, “What is the best price for antique silver trays?” On the one hand it makes me smile a bit because there are countless things to consider -I’ve outlined some of them here – but I also understand their confusion and concerns. 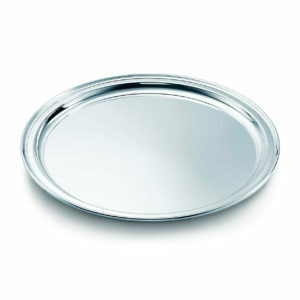 The truth is, a silver tray can range anywhere from $35 to $80,000! The real question is: How much do you love tea? I’m joking, of course, but just like art it really comes down to a few simple questions: Are you looking for something highly collectible or just something you would enjoy having in your home? And the other question is, how much are you willing to spend? There is really no right or wrong answer. There are many expert antique dealers in your area who will be more than happy to take the time to walk you through what they have in their collection and, hopefully, have some very interesting stories to tell you about it’s history. 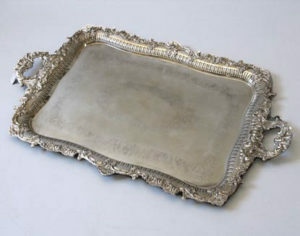 Here is an example of a Salver tray. One of the earliest styles of serving trays. They generally refer to flat silver trays without handles are were primarily used by the aristocrats of the 17th Century. You may sometimes find them with ‘footers’ or supportive stands. Silver trays from the Gregorian Era (1714-1830) take on a very different tone. This is often referred to as the Golden Age in silver trays. 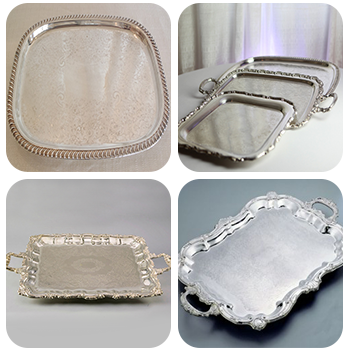 Silversmiths would craft magnificently decorative trays of impressive quality. These are very highly sought after. Many different styles of design and decoration have emerged over the years, from the simple salver and the handled tray shown above to trays lined with beautifully crafted brims and the simplicity of the modern era. Your choice in the matter all comes down to those two questions I asked you earlier. Something as elegant as this is both timeless and representative of the home in which it sits.